After learning about the slope-intercept form, let's see some examples on using it to draw the line for any equation of a line (linear equation). 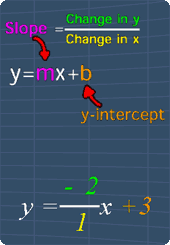 An equation of a line that is in the slope-intercept form can be used to quickly draw the line of that equation. You should proceed by reading the study tips and watch the math video below. After that, you can try out the practice questions. This lesson involves some knowledge on slope-intercept form of a line. You can learn about it by watching the math video in this lesson. If you are given an equation of a line, it may not be in the slope-intercept form. Now, watch the following math video to learn more. Slope-Intercept Form (Examples) from MathExpression.com on Vimeo. This lesson shows you some examples on how to draw the graph of the equation of a line, that is in the form of slope-intercept. Let's consider the equation, y = -2x + 3. Now, we can see that this equation is already in the slope-intercept form, with the slope as -2, and the y-intercept as +3. So, how do we use the slope and the y-intercept to draw the line? To draw the line, we use the y-intercept first. Since the y-intercept is +3, we know the line will cross the y-axis at +3. Therefore, we can put a point with the coordinates of (0,3) here. Next, with the slope of the line as -2, we can use this information, if we know that the slope is equals to 'change in y' over 'change in x'. Since the 'change in y' over 'change in x' is a fraction, we need to change -2 into a fraction so it can be used. To do so, we simply rewrite -2 as, -2 divides by 1. Since this division gives back -2, the slope remains the same. With this, we now know that the 'change in y' is -2, and the 'change in x' is 1. Now, to use, 'change in y' and 'change in x' , we need to refer these 'change' from a point on the line. Now, the only point that we can refer from, is the point (0,3). So, starting from here, since the 'change in y' is -2, we move down from this point by 2 units. Next, since the 'change in x' is +1, we move from here to the right by 1 unit. Notice that now we have 2 points. By drawing a line through these points, we have the graph of y =-2x + 3. Next example, let's draw the graph of 3y -2x = -6. Now, Notice that we have a problem, this is because the given equation is not in the form of y = m x + b. Hence, we need to manipulate this equation into this form before we can draw it. To do so, we need to make 'y' as the subject of the equation. So, in order to achieve this, we need to remove -2x. We can do so by adding +2x to both sides of the equation. This give 3y = +2x -6. Now, we can remove this positive sign to make the equation looks neater. Next, we need to remove '3' from 3y. To do so, we divide both sides of the equation by 3. By dividing both sides by 3, we get the equation as y = 2x -6 divide by 3. Now, we can split this term into 2 fractions. This gives y = 2x/3 -6/3. 6 divides by 3 gives 2. 2x divides by 3 can also be written in this way. Finally, you can see that we have change the equation into the form of y = mx + b. Now, clearly the y-intercept is -2. Hence, the line will cross the y-axis at -2. Therefore, we can put a point with the coordinates of (0,-2) here. Next, we know that 2/3 is the slope with the 'change in y' of 2 and the 'change in x' of 3. Now, to use, 'change in y' and 'change in x', we need to refer these 'change' from a point on the line. So, starting from here, since the 'change in y' is +2, we move up from this point by 2 units. Next, since the 'change in x' is +3, we move from here to the right by 3 units. Notice that now we have 2 points. By drawing a line through these points, we have the graph of 3y -2x = -6. You can start by going through the series of questions on slope-intercept or pick your choice of question below.